let's look at the calendar of upcoming events. It is still possible to take advantage of early registration for the American Astronomical Society (AAS) winter meeting in Washington, DC, January 8-12, so be sure to check that out and sign up and I will see you there. 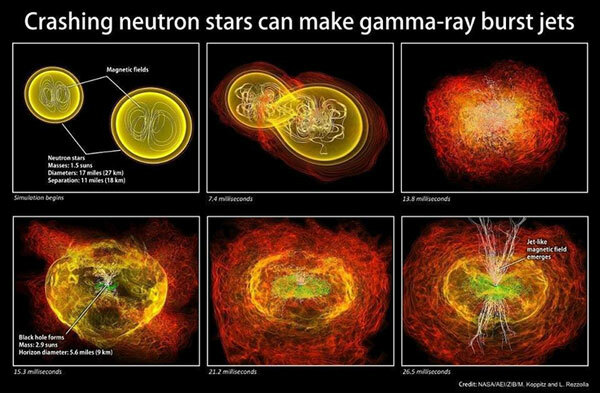 Next, we have a lot of other topics that just happened to come together at this time, so check out the following simulation graphic showing one instance of the merger between two neutron stars and the resulting compression of magnetic fields and generation of gamma ray jets. I wish there was more description of the simulation timeline and what the various colors represented but that is all there was. We can imagine that the merger resulted in intense r-process formation of radioactive elements, whose spectra would have soon been observed even as the black hole forms at the gravitational center of the merger. The intense magnetic fields of the neutron star cannot just disappear and must be conserved and supposedly play a big role in generation of the gamma ray jets. Some interesting physics going on there that was not completely explained, or perhaps even understood. 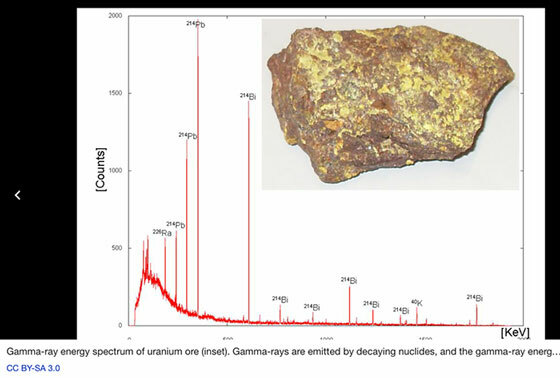 At the same time, while trying to dig further into those details, I found this interesting Wikipedia article on typical spectrum of gamma ray emission from a sample of radioactive uranium. The point is that these spectral fingerprints, caused by other radioactive elements formed by the intense r-process evens during the merger, show up and can be observed. In fact, it is probably the case that most of the observed light is due to the decay of the radioactive elements produced during the merger. Radioactive uranium and other elements that exist on the Earth today could have been formed during a supernova event or binary neutron star merger event, just like the one recently observed. 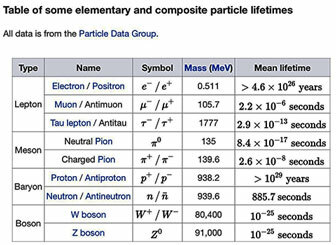 Separately, in looking up information on the decay of radioactive elements, I came across this other table showing some limits on the possible decay of elementary particles like electrons and protons. Electrons are not expected to decay by many current theories, but some theories predict the decay of protons. The most interesting thing for me is how the problem is presented in terms of the scientific method. Note it is not that you start with the presumed fact that protons do not decay, but you make an observation and then state what you have found. The observations lead to the prediction that under current observations the mean lifetime of protons is greater than 10^29 years, which is at least a billion, billion times longer than the age of the universe. At the same time, even though electrons are supposed not to decay, the latest measurement only establishes the electron mean lifetime as greater than 4.6 x 10^16 years. I still find the way that scientific investigation is framed in terms of what can be measured to be a key point that we all need to keep in mind as we are faced with a wide range of news, even fake news, and theories and always ask what evidence is available to support that view or what new observation is required to provide evidence for that view. Ok, finally on to the UCI Physics colloquium that occurred just before we left for our hopeful dark sky observing session in Julian. 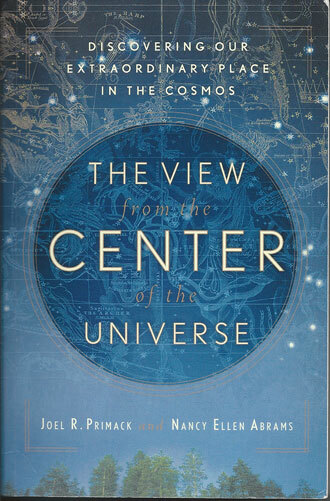 The topic was the observational evidence for showing the connection between galaxy halos of dark matter and the size and characteristics of the galaxy. Professor Primack, UCSC, did an excellent presentation, even though it was a little fast and highly technical for me. He showed many charts and graphs supporting the connection hypothesis, but for me by the time I figured out what the units were on the x-y coordinates, he was on to the next slide. So, even though I enjoyed the show, I determined that my next task was to order his latest book describing some of these questions. So, I went to my friends at Amazon and ordered the book on Friday and then just on Sunday, the book shows up on our doorstep. You probably heard in the news that Amazon's Jeff Bezos is now the richest man in the world. Hooray, if that is the case, I find it amazing that I can command his entire empire by just clicking my mouse and somehow, in a warehouse far, far away, in New Jersey, say, the book is placed on a conveyor belt, arrives at the airport, is flown to the west coast, in placed on another conveyer belt, to be loaded on a truck and delivered to my doorstep without me doing anything other than clicking on "buy now" button. I am in control of that entire empire with just the slightest motion of my finger. Pretty neat! Ok, ok, back to reality and we finally made the journey to Julian, which is only a little over two hours drive away. The weather forecast was for cold, but clear skies for the entire time we were to be there. It sounded great so we, Resident Astronomer Peggy, and Astronomer Assistants, Ruby and Danny, met up with Semiconductor Physicist and OC Astronomers, John and Becky, for what we hoped would be a great dark sky observing opportunity. So, as luck would have it the skies turned very cloudy and even though we tried taking a few pictures, we decided not to set up our tripods or mounts. I had hoped to get some more Milky Way photos, in he same fashion that I first took in Julian, as described in the blog post of August 18, 2015. That iconic photo is the same photo that shows up on the blog site main page, and I had hoped to duplicate that again, but no, the clouds would not allow that. I even tried to just handhold my camera and point at where the Milky Way should be visible, but again, no luck in getting any images. It was quite surprising that nothing showed up in the camera image and then it dawned on me why I probably could not have got any stars or anything even if the clouds were not there. I was trying to use my new 10-18mm wide angle lens and had forgotten that with that lens I was going to have to have much longer exposures. For all you camera lens experts this is probably obvious, but check out the spreadsheet summary of four of the inexpensive lenses I use with my Canon DSLR. Now, I was used to getting good star images of a dim star like Polaris, magnitude 2, with my 300mm lens and exposure time of about 0.5 seconds, so I was left wondering why with a 15 second exposure with my 10mm lens, why nothing at all showed up in the image. Well, the spreadsheet below shows why! The 10mm lens, even with the fastest f/stop setting of 4.5, with its real aperture of only 2.2 mm, would have required 591 seconds to collect the same amount of light that my 300mm lens, with f/5.6 and 53.5mm aperture, would collect in just one second. This chart was prepared just using the maximum lens speed and then calculating the time by comparing the square of the ratio of the apertures, which represents the amount of light that would be received. The lesson we see is that if you want to collect light from the Milky Way or other widely extended dim object, you are going to need a lot of exposure time, which means you are also going to need a tracking mount. Ok, so the night clouds were not going to observe anything, during the daytime, with very clear skies we were able to take in the sights in Julian. One of the things I always wanted to do was to look up old acquaintance, Curiosity Peak Observatory Astronomer, Doug, who I first met, as best as we can recall, at one of the recent Nightfall astronomy events in Borrego Springs, where we first met just as friendly and interested voices in the dark. Anyway, Doug was so gracious in offering to meet with John and I and we had a chance to see the observatory. 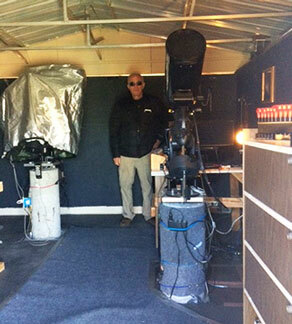 The photo below shows Doug opening up the door to the observatory with a roll off roof. John can take the 1 minute walk up from his home and be in the observatory. Now that is my idea of the ideal way to do observing. 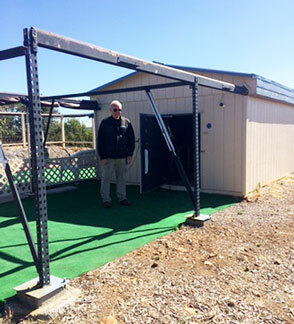 Curiosity Peak Observatory was homemade by Doug and several other associates and includes pier mounted telescopes inside as well as plenty of outdoor space for other astronomers to set up their scopes and support astronomy outreach activities. Thank you Doug for your gracious invitation and we certainly enjoyed the visit. I hope our envious thoughts were not too obvious. If the rest of you readers are interested in other events at Curiosity Peak Observatory, just look up their webpage, posted on this blog site main page. Thanks for everything, Doug! Well after seeing how some folks have a great observatory in a great location and after being clouded out for the second night, we were left with only consoling ourselves at one of the local eateries (Julian Grille the first night, and Romanos, for the second night), both of which were excellent, for the good food and consolation. The Julian Grille offered excellent martinis, while Romanos did not, but they did have an excellent selection of wine. Semiconductor Physicist John recommended a good bottle of Petite Sirah, which we all found very good and enjoyable. 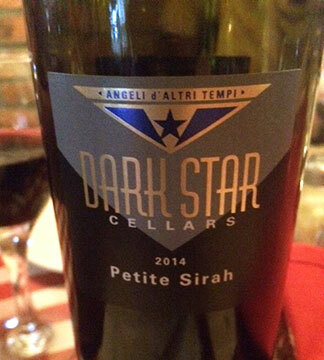 It was only after we finished off the bottle, that the name of the vintners, Dark Star Cellars, was noticed. Now that name was excellent for our consolation drink, first because, all of the stars were dark because we could not see any stars, and secondly, because some real professional astronomers think that actual dark stars, made up of dark matter, are entirely feasible and that they can be emitting some form of dark light, maybe made up of any supposed decay or annihilation products. Check out any article by Professor Katherine Freese, for example, as described in our blog post of June 8, 2017. Well, it was time to pack up and leave after two unsuccessful nights of dark sky observing and the clouds were still present in the morning. 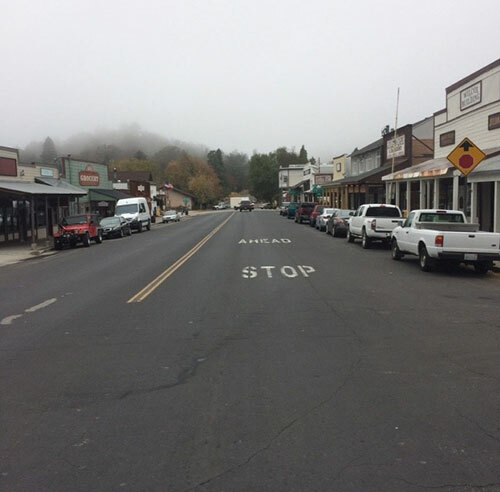 Check out the photo below of Main Street. Resident Astronomer Peggy was not happy with me for stopping and taking this picture, but to my self defense, you can clearly see that the road sign says "Stop." Anyway, there was hardly any traffic and all was safe. 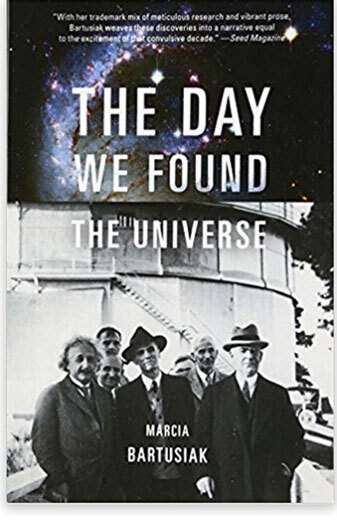 After breakfast, just as we were getting ready to go, I spied a couple of gentlemen reading this book on "The Day we found the Universe." I was only slightly aware of this book and quickly made the determination to talk to my friends at Amazon about getting me my own copy. Anyway, I had to ask about the book and the local gentlemen were so gracious and friendly. I had a pleasant conversation, which I wished could go on longer, but the rest of our party had already left the restaurant and I had to bid my goodbyes also. Anyway, I used my most powerful finger to command Jeff Bezo's empire to jump and deliver to me my own copy of the book. Hurry up Jeff, I'm still waiting! Ok, that is about enough for this long week. It is mind blowing how 2 tiny particles can so much affect when they colide with each other. Thank you for sharing. I would like to request you to keep posting researches like these.